This recipe has kindly been sent in by El Cantara, a Spanish and Moroccan restaurant based on Frith Street in Soho. 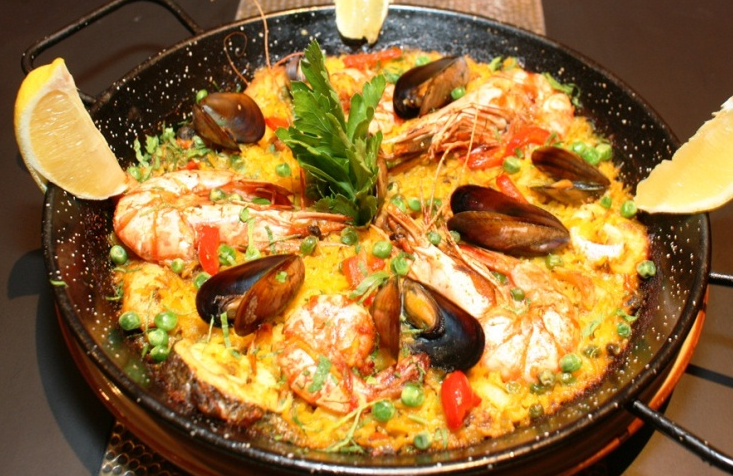 El Cantara have some great dishes on their menu with everything from Tapas to Tagines, so if you make a like their Paella dish, then you could give lunch a go from around just £12.95 per head. 1. In the paella pan heat some olive oil and add the chopped chicken and stir until you hear that the frying has started. Now throw in the chopped onion, pepper and garlic and fry away gently until everything is cooked. 6. Cook on a low heat for five min without stirring to create the “socorrat” (the crispy bit at the bottom) then to finish off place into a pre-heated oven for the last five min or until all the seafood is cooked. 7. For decoration and garnish chop the lemons into wedges and place them into the paella with some chopped parsley.